It wasn’t long after that I began to experience the healing magic of the sea. It all started with a sparkling aquamarine and iridescent mosaic tile vase I saw that was simply alluring. The specific color resonated and invoked feelings and memories of the ocean. It seemed natural to immerse myself in the peaceful colors of the ocean – aqua, light blue, sea foam green, pearl, pale green, deep green, and iridescence – in a color therapy way. Around these colors it felt like a mediation as the ocean of my subconscious was reached. Next, mermaids were calling, but this wasn’t noticeable right away or the first time it happened. The first time was after trying Truth Calkin’s seaweed soup, but on a smaller scale. I was suddenly drawn to mermaids. 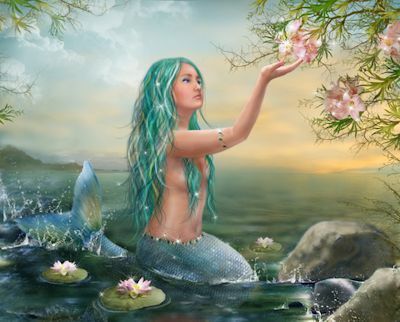 But this time since I was eating seaweed everyday, a ‘mermaid mood’ came over me to sweep me out to sea. Mermaids synchronistically appeared again and again while searching online for example; even unexpectedly at work. The siren’s call was much stronger this time. Decorating ideas for our guest bathroom kept popping into my mind – mermaids/ocean/shells/aqua/etc. The ideas were simply ‘there’ in my mind’s eye. Finally heeding the call, a peaceful mermaid statue with seashells around the base found its home in the bathroom. More ideas came as a boost of creativity seemed to be another effect. 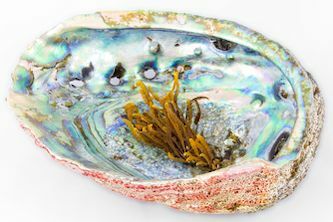 There has also been a strong pull to other gifts from the sea – shells, abalone, starfish, sea horses, shimmery stones and pearly things. Living close to the ocean, its relaxing roar and salty air have been more obvious. Audios of the ocean lull me to sleep at night. I’ve traded Himalayan salt for Celtic sea salt in some recipes. Taking sea salt showers or baths regularly is refreshing, grounding, and clearing.